If visiting Indochina, make a stop in Vietnam. This enticing country continues to attract tourists with its wild natural landscapes, historical temples and imperial cities. 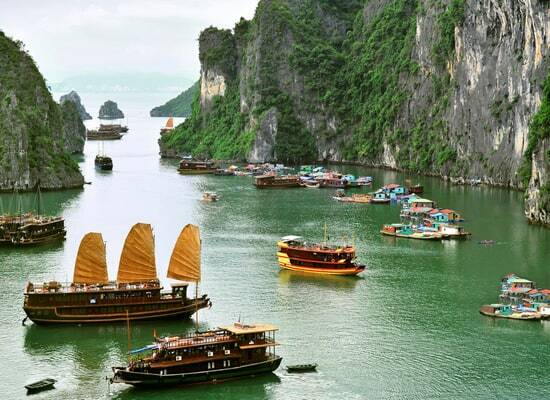 For a dreamy boat ride amongst beautiful bays and beaches, take a tour to Halong Bay. Hoi An is a pretty lantern town on the coast, perfect for exploring on bike. The seaside resort Nha Trang is an ideal location for surfers, also offering ancient remains from the Cham dynasty. Lovers of history will be inspired by the Sanctuary of My Son with ancient red brick temples and buildings from the French colonial period. Vietnam also hosts plenty of festivals, which are perfect for entertaining yourself and for tasting local dishes. Last Updated: November 05, 2018 17:04 ESTThe Health tab was updated - travel health information (Public Health Agency of Canada). Vietnam does not provide adequate sanitary conditions. Medical equipment remains unreliable, and the country is also experiencing a shortage of health facilities and medication. Treatment provided in centres is only adequate for common medical illnesses. If you need to be hospitalized, you should visit the Hanoi Clinic or the International SOS which are frequented by foreign visitors. Pharmacies in Vietnam provide drugs imported from France, India and China. However, be aware that some of the medication supplied in markets are counterfeits and should be avoided. You can dial 115 for an ambulance, but the response time is lengthy and paramedics can be poorly trained. Using a taxi or private car to travel to the nearest hospital is a better option. In the event of more serious health problems, you will be medically evacuated by plane to Singapore or Thailand. Is Vietnam Safe for Travel? Both, a visa and a passport are required to enter Vietnam. The passport must be valid for at least one month after your visa’s expiration date.